With the constraints of our tidal venue and tricky access, historically WWSC has focussed on teaching and racing in Toppers and therefore older, (age 10+, 35kg+) children. 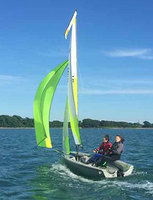 However, the club's successful purchase of 6 SailQubes (plastic Optimists) and 3 Fevas has opened up sailing to both younger and older sailors. In our exposed location, it's frequently too windy for all but the largest children under 12yrs old to go out in a Topper. Age 6-14, 25-45kg: Optimists or a plastic alternative (SailQube, Optibat). Alongside the Club's fleet of 6 boats, we will try to build up the number of families with these boats and the number of children sailing them regularly. The weekend sailing squad will definitely feature these Optimists, with other classes if there is enough demand. Age 11+, 40-60kg: Toppers (using the smaller 4.2 rig at the lighter end of that weight range). The Topper is an incredibly flexible, robust and fun boat for older children to learn to sail and race. You can normally pick up one secondhand as they tend to be passed down through the Club. 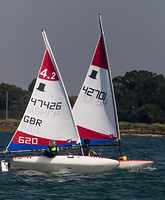 Age 14+, 55-75kg: Laser 4.7, Laser Radial. Still the leading one-design worldwide and with the choice of 3 different sized rigs (including the "Standard") can be taken on into adult racing. Age 12+, 90-120kg total crew weight (2-person): RS Feva - we have 3 available to rent at the Club and would love to see more racing. The Feva is the standard 2-person junior trainer and used for the Schools Regatta each year.